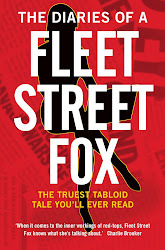 fleet street fox: Consume or try. The season when we are urged to spend money we don't have on things we don't want while eating food we don't like and living with the people we don't like enough to live with all the time. But before we get to enjoy the hot waft of partially-digested sprouts, the forced jollity of an exchange of slippers (with the receipt, just in case) and quite possibly the driest roasted meat it's possible to be faced with, there is the festive shopping spree. Not that the spree is of anyone actually shopping. No, the spree that always sprays at this time of year is the PR blitz of businesses talking themselves and their products up as much as possible so people will buy them. The 'must-have toy' fetish; the 'ONLY TWENTY DAYS LEFT' terror. Let's forget the fact we've had a double-dip recession, all the new jobs the government's been crowing about are part-time and thanks to exceeding our borrowing again we're about to face more public sector cuts and a tax relief raid on pensions. Let's entirely ignore the past two years in which we've been told repeatedly that as a nation we've lived beyond our means, as individuals we've relied on an inflated housing market, credit cards and loans, and let's spend, spend, spend. For today is Cyber Monday, or Mega Monday, or whatever other name PRs wish to give the first Monday of December, when if you believe the hype £10,000 will be spent online every second visiting 115million stores and spending £465million. Let's not notice the fact that Visa - which administers the majority of UK credit and debit transactions online - says its customers will be making 6.8m transactions, which means either online shoppers buy less than 10 per cent of what they look at or the hype is, er, just hype. And let's especially not notice the entirely-unrelated-to-the-hype recent scandals about how the biggest online shopping giants don't pay all the tax their customers might imagine they do, and that there have been calls to boycott Amazon and eBay as a result. The two things are probably entirely unrelated, like sprouts and peas. Just because they're round and green doesn't mean they spring from the same branch. The same is true of tax-avoiding corporations winding up the PR campaign to make them sound popular after several months of bad publicity, because to be frank they do the same thing every Christmas. Not linked at all - just very convenient, like shifting your head office to Luxembourg. It's all a matter of jurisdictions and theoretical, nominated thingummybobs which means it's not the company's fault if they pay less than you might expect - it's down to the way the system is organised. Like Amazon generating between £2billion and £3bn a year in sales in the UK but paying no corporation tax in this country, and eBay paying about one fiftieth of the tax it probably owed (but we don't really know for sure, because they don't tell us). Not their fault, but ours for not picking politicians prepared to tear up the tax code and start again. And if they make billions - well, that's our fault too. It's because it's too dark, cold and busy to go to the shops and actually walk around them, interacting with other human beings, sniffing the roasted chestnuts and returning home victorious with the booty we have personally checked wasn't broken, would actually fit and was the right colour, or had to fight a granny to get our hands on. We'd far rather sit at home on a branded laptop looking at the top three search results from the biggest firms and buy something which takes zero effort or thought and is delivered to the door pre-wrapped. All we have to do is shuffle from the sofa to pick it up, stick it under the tree and if it's broken, too pink or too small we'll just send it back in the New Year at our own expense. And because of that the gravy and the potatoes and the brandy butter sit on our backsides and bellies and we expand while the High Street is starved, with one in seven shops which do pay corporation tax boarded up and 32 closing down every day, their staff on the dole and the tax receipts winking out of existence as warehouses sprawl across industrial estates and we sprawl upon the sofa. Christmas, unless you're about seven, is hell on a stick to start with. It's farts and fights and fannying about with fruit, and it really doesn't need to be made any worse by contributing to our own financial woes by giving what little cash we have to people who give us a more convenient but unutterably more drab shopping 'experience' at the expense of giving us anything much in return. 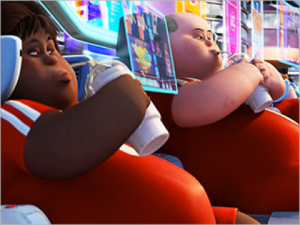 When we all get fat and stuck in our chairs like the human exiles of Wall-E, remember that when we need the help of the welfare system it won't exist if our corporations all shift online and headquarter themselves in the Cayman Islands, and if we keep clicking that's exactly what they'll do. We won't get a state-funded rocket ship, flying chairs or personal TV screens. We'll just get left on that sofa, with only the pizza delivery man to chat to. Stuff Mega Monday like it's a turkey you really resent. Write a list, get off your arse, and get down the shops. Granny will get the Lego set if you don't.